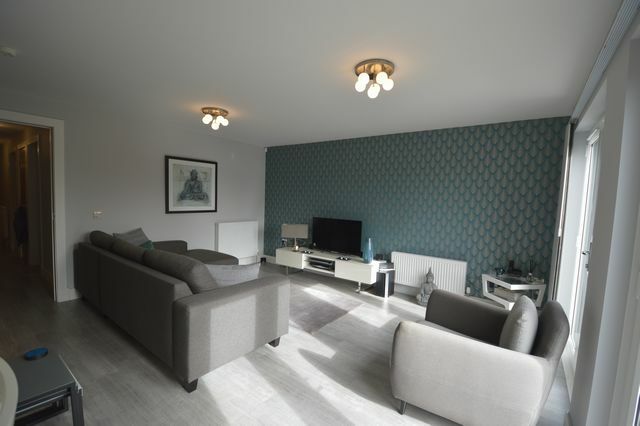 Presented to the rental market is this 3 bedroom ground floor, part furnished, immaculate new build property in an excellent location with private patio and large private garden. The property consists of a open hallway with good storage off along with built in utility. The living room is open plan with a large area given to the living area and double patio doors giving direct access to garden. There is a great area designed for dining and the room is finished off with a very useable, well designed contemporary kitchen with all modern appliances. The master bedroom is tastefully decorated and furnished with built in wardrobes and feature wall. There is a good size ensuite with large walk in shower. The 2nd bedroom also benefits from built in wardrobes, modern décor and neutral carpets. The 3rd bedroom is currently utilised as a study but could provide a great guest room. The family bathroom has a 3 piece white bathroom suite with shower over bath and a great finish. The garden is a great size with a private patio well placed outside the living room. There is also a garden shed. The property further benefits from GCH, double glazing and private allocated underground parking. A must see property!! STRICTLY NO PETS ALLOWED! Landlord Registration: Awaiting. EPC: Pending.